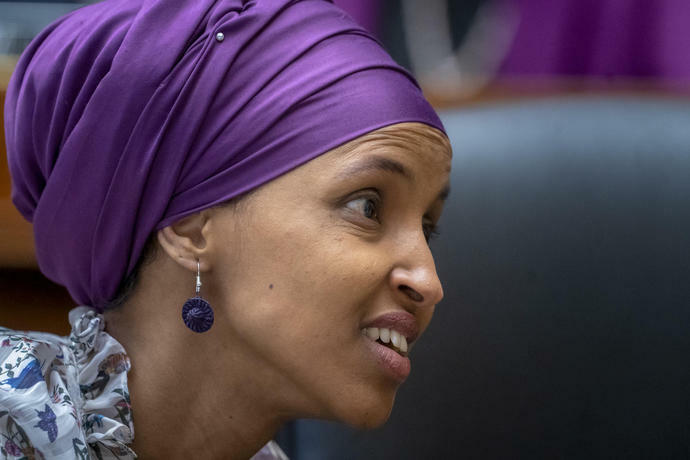 House Democrats have postponed indefinitely a vote on a resolution condemning anti-Semitism after a contentious meeting in which some new members confronted leaders over their push to rebuke Rep. Ilhan Omar of Minnesota. In the party's weekly closed meeting Wednesday, Democrats protested the way Speaker Nancy Pelosi and other leaders tried to rush out a resolution this week responding to Omar's latest remark about Israel. Omar last week suggested the Jewish state's supporters are pushing lawmakers to pledge "allegiance" to a foreign country. That forced Democratic leaders to respond, but their draft of the resolution condemning anti-Semitism angered Omar's fellow freshmen and their liberal supporters. The upheaval prompted Democrats to push off a decision about the resolution. House Democrats are struggling with how to declare they are against bigotry, bias and racism after progressives challenged an effort to rebuke freshman Rep. Ilhan Omar for her remarks on Israel. House Speaker Nancy Pelosi acknowledged during a closed meeting on Wednesday that her caucus faces "internal issues" that require "a clearer understanding of what our purpose is as a caucus," a knowledgeable Democratic aide told The Associated Press. Pelosi cautioned Democrats not to question each other's motivation or patriotism. Pelosi's remarks come as Democrats pull back from their original plan to vote on a resolution implicitly rebuking Omar for saying lawmakers are under pressure to pledge "allegiance" to Israel. Unlike her previous comments about the Jewish state, Omar is not apologizing for that remark, and progressives are supporting her. Nancy Pelosi is one of the most influential people of 2019. Hillary Clinton writes about the first female Speaker of the House&apos;s return to power.